Minnesota Timberwolves forward Nemanja Bjelica in action against the Philadelphia 76ers during the third quarter at Wells Fargo Center. Having missed out on their top targets in free agency, the Sixers continue to do their best to nail the moves around the margins. 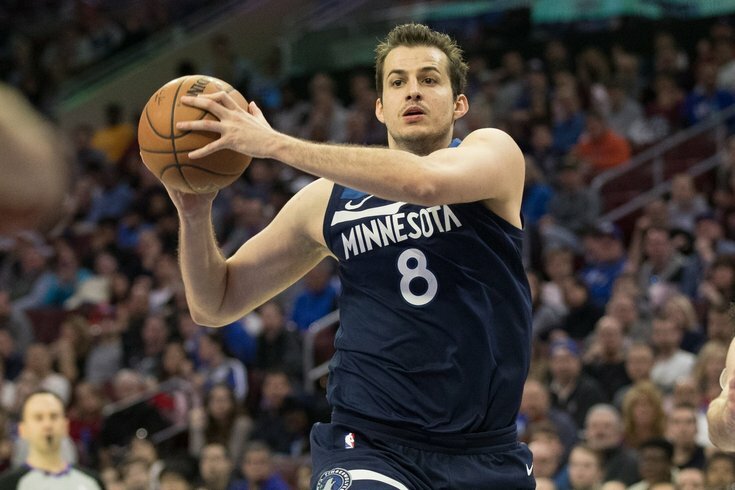 With an opening for a stretch four following the departure of Ersan Ilyasova, the Sixers have agreed to a one-year deal with former Timberwolves forward Nemanja Bjelica for the room mid-level exception, a team source confirmed to PhillyVoice on Thursday morning. Jake Fischer of Sports Illustrated was the first to report the news on Thursday. The man unofficially known as "Professor Big Shots" — one of the best and most preposterous nicknames in sports, for my money — only became available thanks to a cap crunch in Minnesota, where they had to rescind their qualifying offer to Bjelica in order to sign free-agent forward Anthony Tolliver. With Bjelica an unrestricted free agent following that move, yours truly suggested the Sixers should take a hard look at him. I'll try to avoid patting myself on the back too hard, but Bjelica is coming here to do exactly that (minus all the charges taken). He's not going to offer you a whole lot of offensive diversity, but he can shoot the heck out of the ball. Bjelica is a career 37.1 percent shooter from deep, and even that number undersells his ability there because of a blip during the 2016-17 campaign. As a key member of the Wolves' bench and occasional starter last year, Bjelica hit 41.5 percent of his threes on 2.7 attempts per game. The team constructs aren't entirely dissimilar between Minnesota and Philadelphia, with Bjelica accustomed to playing next to a franchise-type big man in Karl-Anthony Towns and more ball-dominant players like Jimmy Butler. That will make sliding into his role as an off-ball shooter benefitting from Joel Embiid and Ben Simmons that much easier. Catch-and-shoot threes are the bread and butter of his game, which will suit him just fine in Philadelphia's offense. Bjelica knocked down 41.8 percent of his looks on catch-and-shoot threes last season, with those shots representing nearly all of his attempts from beyond the arc. Teams respect him a great deal from deep, which will make life easier on Philadelphia's players who make their living in the paint. On some level, this signals Philadelphia's acknowledgment of the sort of players they need around Simmons and Embiid. After bringing in a non-shooter and glass-pounder like Trevor Booker last winter, the Sixers have pivoted into chasing high-level shooters at the backup four spot. Shooting kills in today's NBA, and is especially critical next to Philadelphia's core players. Elsewhere in Sixers signings, the team made the decision to bring back veteran big man Amir Johnson in an agreement struck on the fourth of July. The deal is for one year at the veteran minimum, a source confirmed to PhillyVoice, which is a deep discount compared to the $11 million contract he signed last offseason. Johnson isn't necessarily a fan favorite in Philadelphia, with a lot of fans preferring the more high-octane style of Richaun Holmes. But the elder statesman behind Joel Embiid is a reliable defensive presence and steadying force on the back end, and a good locker room guy to boot. It's no shock that the team would want to keep him around, especially with Brett Brown having an even bigger say in personnel matters than ever before. The real news connected to these moves, frankly, is where it leaves Philadelphia's roster. They're currently at 17 players from where we sit in July, which will need to drop to 15 by the start of the season and doesn't include Jonah Bolden, who remains a likely candidate to join the Sixers this season. At least a couple players will have to move on to greener pastures. Some of the names to keep an eye on: the aforementioned Holmes, who has sparingly earned Brown's trust as a backup center and now has an even tougher road to getting minutes as a change of pace at the four spot. Jerryd Bayless remains a buyout candidate or usable as a potential salary match in trades, and one from the pair of Justin Anderson and Timothe Luwawu-Cabarrot moving wouldn't be the biggest shock in the world. Both of the young wings still have some theoretical upside, but they were pushed down in the rotation last season despite the extra opportunity provided by the roster situation. With Markelle Fultz returning and Zhaire Smith joining the fold — to say nothing of Wilson Chandler joining the group — suddenly things get pretty dicey for TLC and Anderson. If the Sixers choose to move on from Bayless in a salary dump, perhaps the Sixers could attach TLC as a sweetener for a rebuilding team, killing two birds with one stone. In any case, the message being sent by Philadelphia's front office has shifted dramatically since exit interviews took place after the Celtics series. Brett Brown was adamant about the Sixers' need to bring in another star in the aftermath of that loss, and laid down the gauntlet for their offseason in the months since. "If that portion of the fanbase is still prepared to take this notion [of doing it organically] and that's going to equal a championship, it's noble but I don't agree with it. I think another high-level free agent is required. I feel like we have the ability to attract one," Brown said during exit interviews. "I think we treat people well here, I think it's a great place to come in and be a part of a culture and a family." "To say this group can do it now, they obviously proved they couldn't," added former GM Bryan Colangelo. "Adding another talent and another piece is certainly something we're striving for, bearing in mind also that we view Markelle as a significant piece of that future, and that the deal made with Boston was made with the future in mind, and there's a very bright future ahead for Markelle and this team accordingly." But after missing out on their big fish and recouping some future assets, the Sixers have maintained the cautious, patient approach they've used for years. And while it may be disappointing to some fans, a combination of stability and internal development should make the Sixers an even better team than they were last season. Besides, there's still time for big-game hunting next offseason.